My photo of the partial UK Solar Eclipse 2015, taken by my very own hands in Nottingham. I’m desperately trying to avoid using terms like celestial dance, but it is undeniably graceful, the motion of the moon that passes in front of the sun to cast a shadow on the Earth. But a lot of it is down to luck. Partial Solar Eclipse 2015 as seen from Nottingham. Photo by Nick Cook. Please click for a larger quality image. Lucky that the weather for the east midlands happened to hold out long enough, but mainly luck that we have a perfectly sized moon to eclipse the sun. The moon is 400 times smaller than the sun and the sun is 400 times further away, so they appear the same size in the sky. 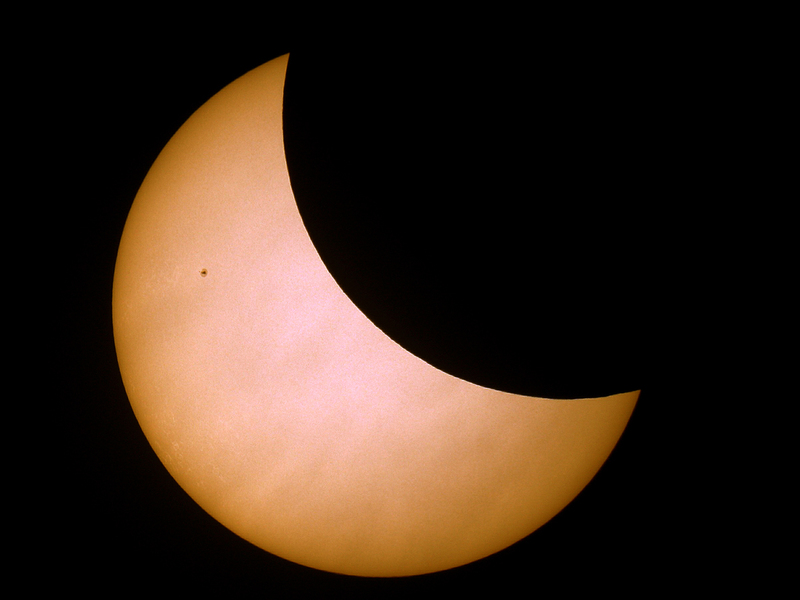 This image of the partial solar eclipse, and sunspot AR2303, was taken at around 09:12 on 20th March 2015, approximately 20 minutes before maximum totality point in Nottingham. Image taken using an 8″ Skywatcher 200p reflecting telescope on an EQ5 mount, Baader solar film and Canon 1000D camera, stacked image of 20 frames with an exposure time of 1/1000 .sec exposure.